Lockheed Martin has unveiled new designs for a human lunar lander that would support NASA’s mission to return humans to the moon’s surface by 2024 and use components from the firm's Orion capsule for faster construction, The Verge reported Wednesday. The company said using the same materials and systems from the already under development spacecraft could help complete development of the new lander within the next five years to meet NASA’s timeline. Lockheed designed the lander with two portions that will separately take astronauts to the ground and carry them back to orbit from the lunar surface. The spacecraft would travel from NASA’s proposed Gateway space station that would orbit the moon. The lunar lander design uses the internal equipment, flight computers and life support systems, among other components found on the Orion capsule. In 2018, Lockheed introduced a reusable lander concept designed to also bring crews to the moon and support future expeditions to Mars. 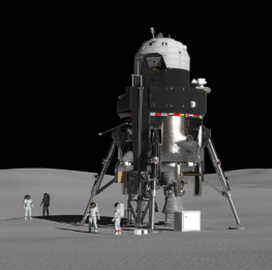 NASA has yet to pick a contractor to build its future human lunar lander and to secure a budget for the program.